And we thought nothing could stop Miley Cyrus! Turns out we were wrong as the infamous singing star cancels her concert in Kansas city when she was hospitalized this Tuesday. 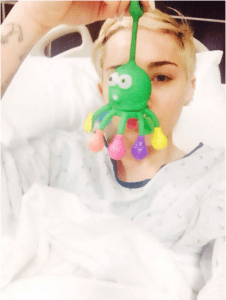 “Im so sorry but somethings are outta my control,” says the singer as she posts a picture of her and an adorable little octopus right from the hospital bed. Two days and Miley still doesn’t seem to have recovered enough to get back on stage. However, she is constantly in contact with her fans via her Twitter. According to the doctors, Miley is suffering from a severe allergic reaction that may be caused by antibiotics prescribed for her sinus. The singer was taking Cephalexin during her tour in N.C just a week before her Bangerz tour was scheduled. However, Miley has been under the weather for quite some time. Earlier this month, she has to cancel her Charlotte concert due to severe influenza. Despite not being her hundred percent, Miley did manage to hit the stage in Raleigh shortly after that. While the doctors do not term her current allergy as a huge risk, they do admit that it is a severe kind of reaction and may require the 5 to 27 days for complete treatment and recovery. They say that Miley will remain hospitalized until they see some improvement in her condition. However, we do hope they are not keeping the singer to treat her for ‘Selfitis’ (the selfie-taking) disorder, which many claim to have been officially declared a mental disorder by psychiatrists. Meanwhile, Miley’s official reps have asked for compassion and privacy from her fans. With frequent tweets and picture from the hospital bed, we are not quite sure if Miley is one the same page with her reps.
Tweets or twerks, Miley knows how to make a headline, yet she doesn’t seem to be the only one ‘snapping’ in the ‘sanatorium’. Former politician and bodybuilder turned actor Arnold Schwarzenegger also tweeted the photo of his handsome 20 years old son while he was knocked out from anesthesia before his surgery. Two most funny things about Patrick’s picture are his father’s funny frown, and the fact that no one mentioned why the young hunk went under the knife anyway. The word is, he might be having a hip surgery. Why the well-endowed youngster needed one remains a mystery though!